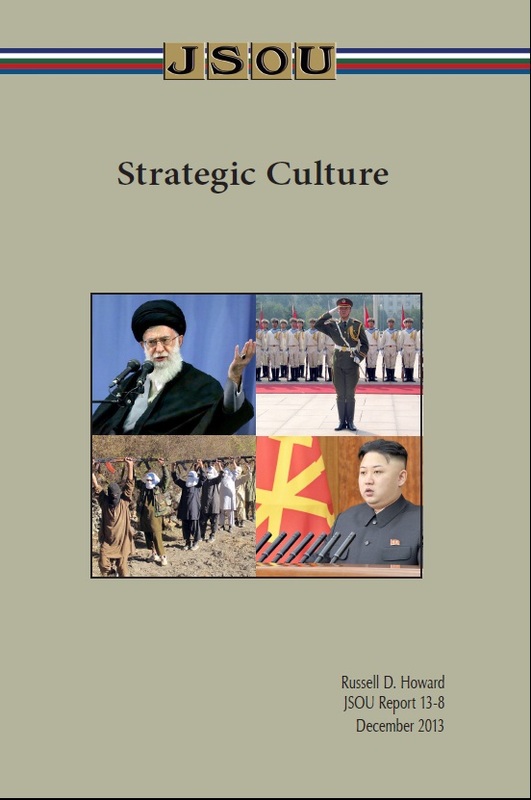 In this monograph, Brigadier General (retired) Russ Howard presents a substitute for traditional International Relations Theory by asserting that strategic culture analysis of states and non-state actors or groups is a better predictor of behavior. Specifically, General Howard posits that studying and understanding the strategic cultures of threatening states and non-state actors might be a more useful mechanism for analyzing potential adversaries’ proclivity to using force to further their strategic security objectives. The author delves into the strategic cultures of The United States, China, Iran, North Korea, and al-Qaeda before analyzing commonalities among them. This founda­tion allows General Howard to then develop and provide actionable policy guidelines to contextualize an end state which strategic cultural analysis can provide. This strategic culture analysis can be beneficial to all echelons, from the SOF operator in a village who must understand and work within the strategic culture of the operational environment, to the policymakers who must decide National Strategy. 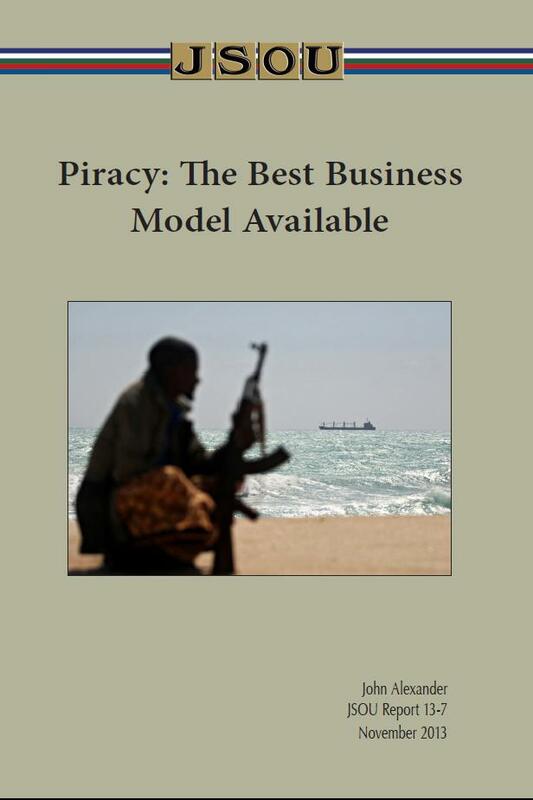 In this monograph, Dr. Alexander sets the stage with a brief historical account of how maritime piracy has evolved over the centuries to its current state: a vast enterprise whose increasing profitability has attracted a confluence of nefarious actors including warlords and international criminal organizations. Dr. Alexander speculates on the potential for intersection between pirates and ideological terrorist movements such as al-Qaeda and Associated Movements. Such a future would significantly elevate the stakes in a U.S. whole-of-government counter-piracy response. What role should the U.S. military, and Special Operations Forces (SOF) in particular, play in addressing the global issue of maritime piracy? Dr. Alexander points out many of the thorny legal considerations that contextually color any efforts to address counter-piracy and notes that the best solution to criminal acts occurring hundreds of miles at sea may in fact lie with efforts, including the use of SOF, to improve the security apparatus on shore. In this monograph, Brigadier General (retired) Russ Howard and Ms. Colleen Traughber delve into the nexus between violent extremist elements and transnational criminal elements by first clarifying whether a real problem exists, and if so, what is the appropriate role for Special Operations Forces (SOF) in confronting it. The authors bring rigor to the subject matter by dissecting the issue of intention and opportunities of criminal organization and violent extremists. The authors note the wide variance in the motivations and opportunities of both different criminal organizations and extremist organizations. And make clear that the trafficking of humans, weapons, drugs, and contraband (HWDC) is a natural way for the criminals and extremists to cooperate. To bring the issue into focus, the authors systematically examine case studies dealing with the nexus between specific organizations and HWDC trafficking opportunities. 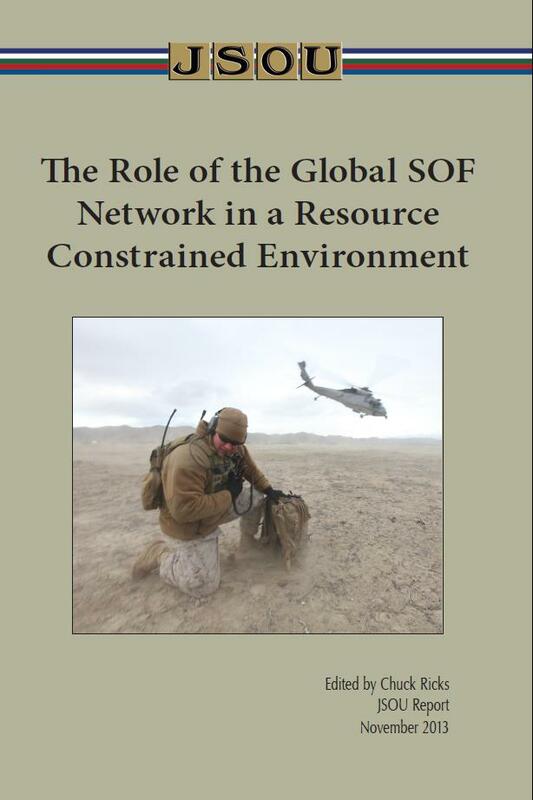 The authors transition from the vignettes to how this nexus will impact SOF and interagency partners. They then identify issues for SOF including the traditional delineation between law enforcement activities and military activities. 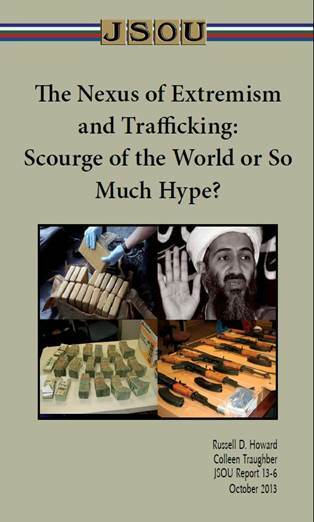 The Nexus of Extremism and Trafficking Scourge of the World or So Much Hype? In February 2013, more than 125 Special Operations Forces SOF personnel from Canada, the United States, and eight other countries gathered at MacDill Air Force Base in Tampa, Florida, for a two-day symposium on the Role of the Global SOF Network in a Resource Constrained Environment. This was the third symposium in a series held by the Joint Special Operations University and the Canadian Special Operations Forces Command Professional Development Centre. The event featured a mix of individual presentations, panel discussions, and social interaction to introduce issues, engage in productive discussions, and strengthen SOF network relationships. The focus ranged from the tactical (The Acid Test of Reality—Experiences of the Operators) to the strategic with senior civilian and military leadership from both Canada and the U.S. assuming active, contributing roles. This report offers insights and suggestions on how to deliver operational success while accommodating both changing mission sets and resource constrained environments. Introduced by the Vice Commander of USSOCOM, this Third Edition builds upon the success of the earlier versions and continues to incorporate the evolving policy guidance and strategic vision that guide ongoing interagency counterterrorism efforts. It provides an outline of organizations, missions, programs and relationships that comprise the interagency process. 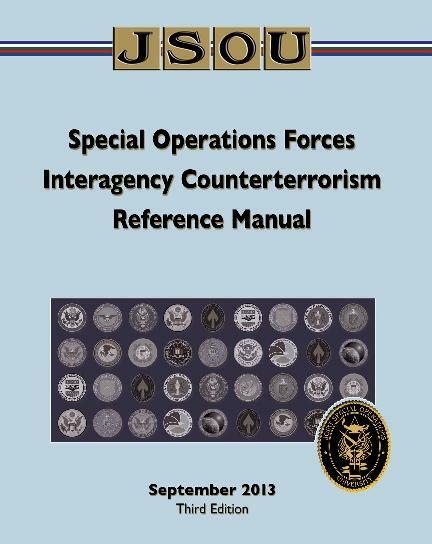 This manual provides insight and information regarding various counterterrorism organizations in the U.S. Government national security apparatus. Also included is an explanation of the expanded concepts of civilian power and their implications for Diplomacy and Development that emerged from the publication of the First Quadrennial Diplomacy and Development Review in 2010. Expanded sections on countering terrorist finance operations, interagency responses to cyber threats, and strategic communication reflect general acknowledgement of the importance of these capabilities. As before, updated collections of definitions, organizations, programs, and acronyms are included to provide the special operations warrior with an improved, practical, quick-reference guide to the interagency community. 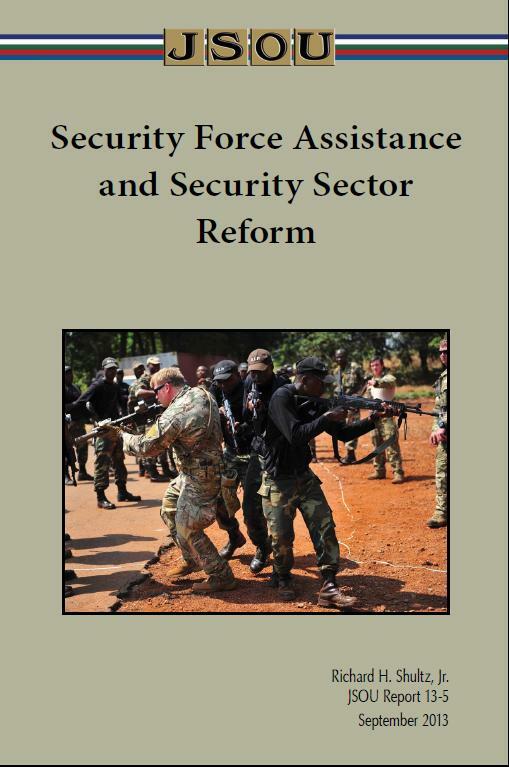 Security Force Assistance and Security Sector Reform by Richard H. Shultz Jr. 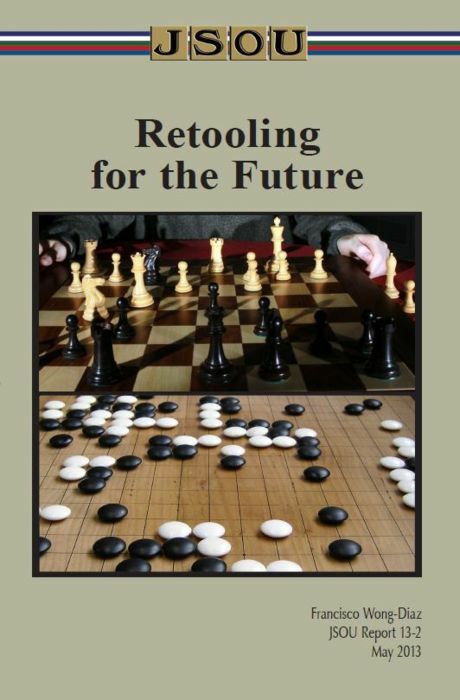 In this monograph, Dr. Shultz conducts a study of the impending requirements and likely contexts in confronting future security challenges. He argues that weak and failing states will play a central role in coming conflicts. Dr. Shultz advocates for not only engagement in these failing states, but to engage as early as possible to prevent the growth and festering of violent extremist organizations which will require larger more costly intervention later. He specifically recognizes the need for an irregular warfare tool to engage early through security sector reform to prevent just such growth. Dr. Shultz delves into five key issues to find patterns and common logic to support early engagement. Importantly, he identifies the contributions SOF can make to a new U.S. security force assistance and security sector reform strategy. 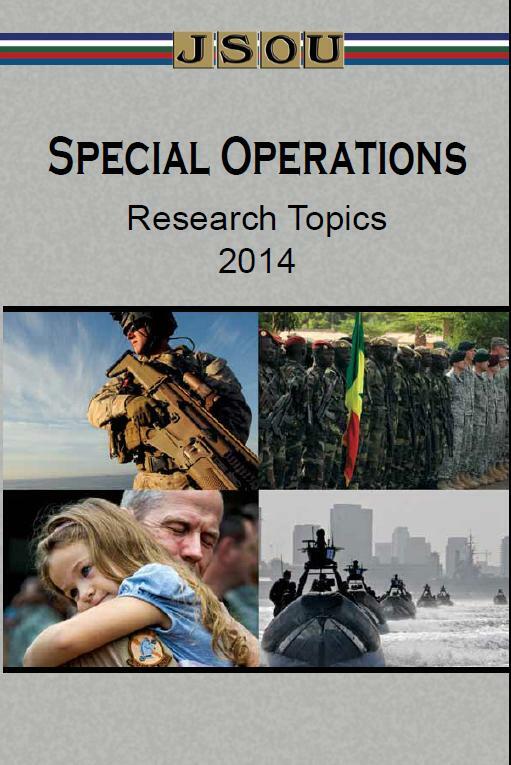 The Special Operations Research Topics 2014 publication presents a list of SOF-related research topics for research to be undertaken by PME students, JSOU Senior Fellows, and other SOF researchers who desire to make timely and meaningful contributions to SOF issues and challenges. Each year representatives from USSOCOM, the Theater Special Operations Commands (TSOCs), SOF chairs from the war colleges, and Joint Special Operations University (JSOU) senior fellows meet at the JSOU campus for three days to collaboratively review topic submissions received from the SOF community and debate emerging issues and challenges. That collaboration results in the first draft of this publication, a prioritized list of salient issues confronting SOF. The list is vetted through the components and TSOCs to ensure that research will advance SOF missions and support SOF interests. Ultimately, the research, study, and debate of these topics will inform decision makers and better prepare SOF for our current conflicts and future challenges. Major McCulloh and Major Johnson wrote this monograph on Hybrid Warfare while they were students at the School of Advanced Military Studies, Fort Leavenworth, Kansas. Written in two parts, their individual approaches complement each other by providing a synergistic combination of both an overarching theory as well as an operational perspective. 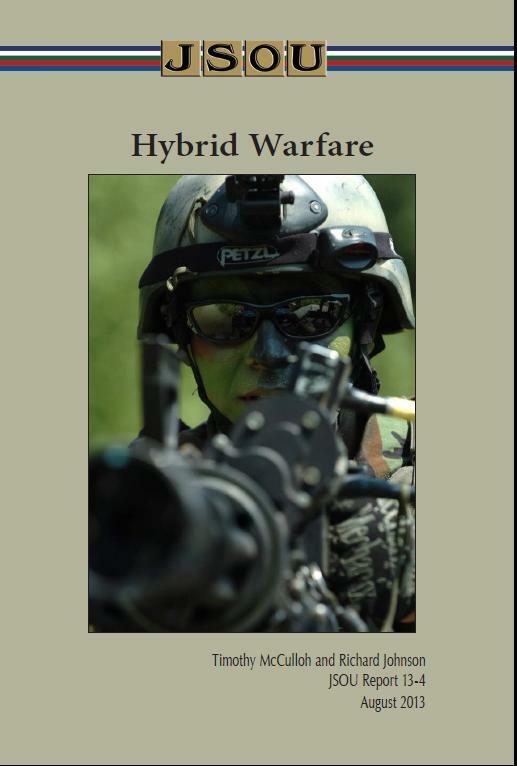 While the idea of hybrid warfare is not new, the authors together provide a clarity and utility which presents a relevant contextual narrative of the space between conventional conflicts and realm of irregular warfare. Major McCulloh’s contribution in the first section lays the theoretical basis to bring a definition of Hybrid Warfare into focus while addressing the pertinent question of its historical origin. Major Johnson’s section uses historical examples and case studies to form a basis for approaching hybrid threats through a lens of U.S. oriented operational art. The authors contribute to the understanding of warfare as a spectrum of conflict rather than a dichotomy of black and white alternatives. The publication of Dr. Wong-Diaz’s monograph coincides with the major strategic reassessment of U.S. national security interests and future military posture taking place at the national level. The strategic environment of today requires astute statecraft to formulate and execute grand strategy--strategy that effectively blends all forms of power and uses them smartly. 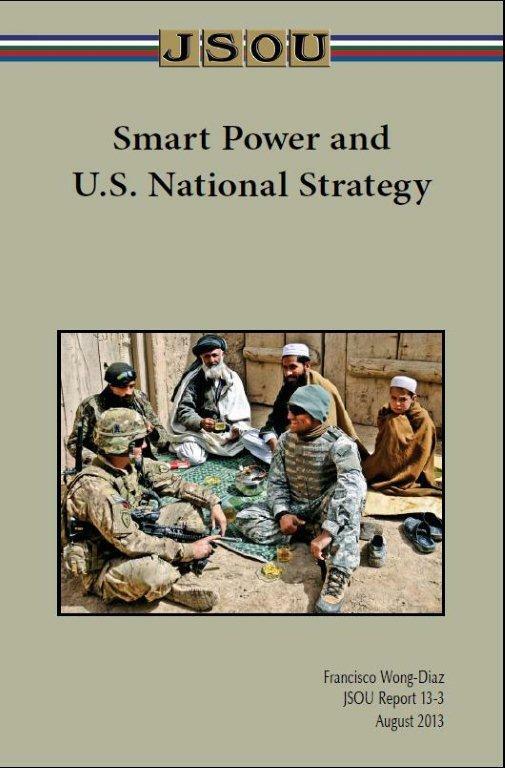 Though there is no consensus on what constitutes smart use of U.S. power, the concept of “smart power” is a dominant theme in policy circles. Smart power, however defined, is directly relevant to the SOF community. With a smaller footprint than conventional forces, SOF are both a cost effective and less visible instrument of national power. SOF are expected to combine both hard and soft power approaches instinctively to achieve strategic level effects. Using case studies from around the world, Dr. Wong-Diaz expertly draws the links between the strategic level projection of power by states and their consequences on the ground. Dr. Francisco Wong-Diaz looks at the importance of China’s strategic culture. While many see an inevitable strategic conflict of interests between our two countries, others see the rise of China as an opportunity for the U.S. to collaborate on international security. Businesses see potential for new markets. Although perceptions vary dramatically, it is clear China cannot be ignored. Dr. Wong-Diaz analyzes the Chinese concept of unrestricted warfare (URW). Whether the Chinese approach economic and military parity with the Unites States is of secondary concern to the strategic vehicle they will use to influence regional and global behavior. Although URW will fundamentally challenge the United State’s capability to engage China with a coherent strategy, the U.S. does have an opportunity to proactively come to grips with the strategic challenges of a regionally dominant China. In this concise JSOU monograph, Dr. Rich Yarger considers the 21st century security environment, previous work on special operations theory, and various other perspectives of SOF gleaned from his research to synthesize an American SOF school of thought, which he argues provides a foundation for developing an American special operations theory for the 21st century. He offers definitions, premises, and principles that explain modern American special operations over the last 70 years and can serve SOF well into the future. Based on his research, he identifies major areas of concern for SOF leadership. As USSOCOM confronts the challenges offered by the 21st century and policymakers continue to look at SOF as a preferred means to address numerous and complex security issues, theory is essential in determining and explaining the appropriate roles and missions for SOF in the 21st century.